Re: List your test equipment "scores" here! mostly on ebay but some from local surplus stores. agilent function generators, power supplies, fluke 45 (2 of them), misc other lab flukes all at 'motivated' prices over the last few years. very few things just given to me, but frequent searching of the bay and local surplus stores have helped build my home lab to where its competitive with many small and even medium sized bay area companies. I have so many duplicated boxes (function wise) I am running out of room and should sell the ones I don't use anymore. I like buying on ebay but afraid to sell there: too many scary stories and I just cannot afford to be ripped off by buyers who are less than honest. maybe I will try to craigslist my extras. too bad ebay is just not worth selling on, anymore (for me, anyway). I like buying on ebay but afraid to sell there: too many scary stories and I just cannot afford to be ripped off by buyers who are less than honest. maybe I will try to craigslist my extras. too bad ebay is just not worth selling on, anymore (for me, anyway). What's the problem with ebay? You would accept PayPal only, right? I thought that was safe, on both sides (although I only have experience as a buyer). sceanario: sell a piece of good gear on ebay. buyer gets it, swaps it with a broken unit (or breaks it himself) and returns it. even worse, he could return a box of rocks and as long as it has the right weight and was mailed to the 'right' address, paypal will not side with you. just too much risk. if there was a trustable escrow, that would be great, but I have not heard of that for years. I did use an escrow once when I was buying a $1k used camera body, but that was nearly 10 yrs ago. buyers have more rights than sellers and you have to hope you don't run into a bad buyer. most buyers are probably fine and most sellers are, too; but the risk is just too high for several hundred dollars of gear, each. also, paypal can freeze your account and hold your money for as long as they want (in the US). they are NOT a bank and can get away with murder. if I'm buying, I don't have funds in my paypal account, but if I'm selling, I would; and I simply do NOT trust paypal to 'watch over' my funds. when ebay was a garage sale style site, that was great. now its mostly about power sellers and cheap trinkets. the nice multi hundred dollar test gear is not what ebay is about these days; they are about selling cheap junk from china and the small time seller gets no respect from paypal or ebay. I can't average out my losses and so if even one of my meters or supplies gets stolen by a bad buyer, it would crush me. I'd rather keep the gear and not make money from it than risk being an ebay seller, to be honest. Re: List your test equipment &quot;scores&quot; here! You guys are making me drool here. I found a Kinsten UV light box along with a large supply of etchant, drills, photosensitive board, transparent film and misc other stuff on Kijiji once for pretty cheap. Can't remember how much but I drove quite a few miles for it. I've had tons of use out of the light box and am still working on the chemicals. I never seem to come across used gear. might try selling some items on the forum. Most people here are honest, right guys? Yes I agree with echen1024, most people are honest. But I see linux-works's points too, and if he doesn't want to take the risks then that's ok.
All I can say is that I have bought a lot of stuff from ebay (from all kinds of sellers ) and have never been stinged. I would have expected it to happen a long time ago. Good idea IMHO, and only use PayPal for payment. Should reduce risk exposure, and still keep monetary aspects easy enough for both parties, as well as reduce the fees for linux-works. before ebay, back when USENET was a good way to buy/sell gear, I used to use COD a lot. you could check 'cash only' on the form and not have to worry about getting a bad check. easier: have the receiver go to the PO, buy a money order right there and that is what gets sent back to the seller via return mail. COD also ensures the mailman can't just leave the box 'in the bushes' since he has to collect money from the buyer. it also motivates the shipping company to treat the box a bit better, as the receiver won't even sign for a box that is beat up. it helps everyone on both sides. no one seems to do COD anymore, though. No, COD went away because neither private delivery companies nor the USPS want to go through the expense/hassle/accountability of having their employees bonded for handling cash. you can still ship COD via USPS. did they fully take that option away? I know its not commonly used but I didn't think they removed the option. not sure if ups/fedex ever took COD. also, one good thing about using US mail (for those in the US) - is that if there is misrepresentation, its mail fraud and that's taken pretty seriously by the post office. used to be, at any rate. even if you only do the COD for a token $10, it ensures that the postman HAS to meet a real adult person and not some random person who will 'accept' the box or the postman just leaving it 'with a neighbor'. the end-to-end reliability of COD was really a neat thing and worth the cost to me, for sure. Well today, I picked up a "box-o-meters". Happened to see the ad at the right time to be the 1st caller on it. Some probes and what not. A Fluke 189, works, but the battery terminals are damaged from leaking batteries. You can also get good deals buying ex rental RF test gear that has reached the end of its 'rental' life. eg stuff that is no longer supported by the manufacturer for spares or repairs. When this happens the rental company will often offload the equipment cheaply. I've bought some seriously good test gear this way numerous times with some fantastic deals although you are usually looking at fairly expensive lab grade test gear. But you can sometimes get ex rental items at about a third of the price of the typical ebay 'buy it now' price from the various online test gear dealers. You can sometimes buy stuff that is still officially in calibration. eg I recently purchased an HP/Agilent sig gen that still has most of its 2 year calibration left on it. i.e. the Trescal calibration sticker expiry date is in 2016. Note: there are obviously advantages and disadvantages to buying ex rental gear. But the biggest advantage is that you know (within reason) that the gear has been properly maintained/serviced and calibrated over all of its life. Also, rental companies tends to fit the top options to the test gear to improve the appeal of renting it. The sig gen I bought had two very expensive options fitted and a VNA I bought from the same company had every single internal and external option with it. So you kind of get these options for free. I picked up a perfectly functional MFJ-259 antenna analyzer at a ham radio yard sale for $10 with the case. Both of the 9V battery connectors were bad so I replaced them though I haven't gotten around to buying the battery holders yet. I use it with a wall wart that I had so the holders aren't a big deal. It has more than paid for itself for my own antennas and for helping other hams with antenna projects. I had to replace the battery holders on an MFJ-259B and luckily MFJ sells replacements. Mine were melted through at the AA battery terminals so I wonder if the user tried to recharge normal batteries. Off lease gear sometimes gets dumped at hamfests especially if it has problems and isn't worth it for them to repair. I have a pile of Tek 24xx and TDS 7xx series scopes that I need to recap or fix random issues (GPIB errors, bad focus, etc). The caps on the TDS scopes are going to be fun. I just piked up a Tektronix 184 time marker generator for 40$ at Apex Electronics in Sun Valley, California. It was hard to choose what to bring back with me back home (I'm here on vacation) but it was hard to pass up, and easily fits in my carry on bag. Not the deal of the century compared to some of you, but I'm happy. That is a true steal. Wasn't supposed to get it, but was in the right place at the right time with cash. To be responsible, but never to let fear stop the imagination. $20 at the local swap meet last night. The meter appears, in comparison to my Fluke 189 is pretty darn close in readings. The last calibration done by Fluke on it was Sep of '86. 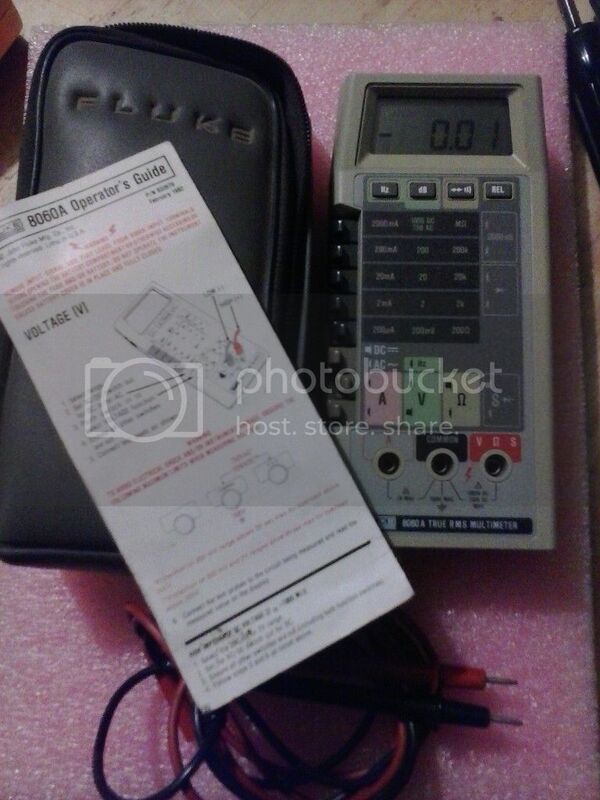 I've just bought a HP85644A tracking generator source for my HP8566B spectrum analyser. It was advertised as 'won't power up' but all that was wrong was a blown fuse due to someone running it at the wrong input voltage selection. Just grabbed a fully working Fluke 54-II without the yellow rubber jacket for 75$ USD + shipping. cal sticker says 2009.